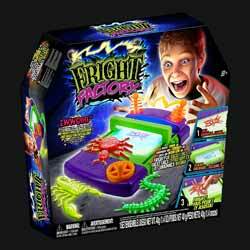 The Fright Factory Creature Creator is a fun, old school activity that all the family can enjoy. Chose one of the moulds and then fill in the outline with the Ewwgoo pen. Place under the UV lights and wait for it to set. Then pop it out of the mould and you have a new friend to play with. 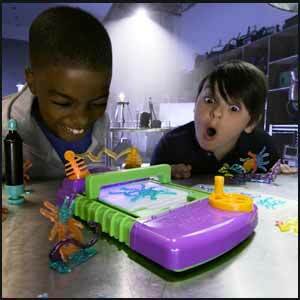 This toy is easy to use, but you're going to have to use your head if you don't want to make a mess all over the place. It's common sense, but reading some of the reviews on Amazon, I was surprised how few people appear to have very little common sense. Firstly when using the Ewwgoo pens you don't cover the mould in the Ewwgoo, you simply follow the channels on the mould. Secondly, when putting the mould under the UV lights, the instructions don't specify how long it takes to dry (this is, I'm assuming because each of the bugs are different in size and therefore some of the channels for the Ewwgoo to go in are deeper than others. This means that different bugs will take varying times to dry. The best way to check is to touch the bug and see if it's still tacky. If it is, give it a while longer. When you peel the bug out of the mould, gently twisting the mould will help free your creature. You can also use different coloured pens on the mould so that your creatures come out multicoloured. You'll need 3 x AAA batteries (not included) and a small screwdriver to get into the battery compartment. You can also buy additional packs that include new moulds with different creepy crawlies as well as more Ewwgoo pens. For an afternoon of hands on creative fun, this toy ticks all the right boxes. It's also likely to be a huge hit around Halloween as the bugs will look great as decorations around the house.